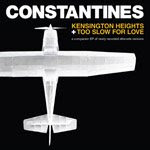 It's a year too soon for a new Constantines full-length, as their usual hiatuses tend to go, but a new supplement to last year's Kensington Heights was just released, an EP of seven tracks, stripped-down versions of songs past, mainly, called Too Slow for Love. Only accessible in pairing with Kensington Heights, the EP highlights the strength of the Constantines' songwriting and musicianship, and contains as much natural beauty as their more recent full-length efforts. The largest difference here is actually in the respective vocal tones of Steve Lambke and Bryan Webb, their voices a bit less outwardly expressive, more to get the words across than convey any style in particular. Nowhere is this more apparent than on "Shower of Stones," where there are no tumbling walls built into the music, Lambke perhaps a bit less convincing than he was on Kensington Heights. But the emptiness works beautifully with Webb, whose usual roughness is stripped away here. And with every song bare as can be, slowed to the same numb pace, "You Are a Conductor," for most the forgotten track of Tournament of Hearts, is now a highlight, its poetry more noticeable above a light drumroll, rather than buried beneath the powerful, periodic guitar strum that's much lighter here. The high point of Too Slow is Webb's solo acoustic version of "Our Age," demo-quality with light reverb carrying his shy voice, his finger-picking light and precise. A good deal of vulnerability shows through here, even with that light numbness replacing the passionate call-out that appears on the album's soaring version. The sound of his fingers sliding across his steel strings adds human warmth and imperfection to a song once of strong, inspiring tone. Much of the same can be said of the alternate version of "I Will Not Sing a Hateful Song," so much better than its Kensington Heights counterpart, also acoustic and sung from a microphone which adds distance, and joined only by a light touch of the highest keys of a piano at first, then, a bit of embellishment from a second guitar. Even the Constantines' unfinished works are gold. Purchase Kensington Heights and Too Slow for Love together for five bucks! Hey Would You Mind Re-Linking These Songs? I'd Love To Hear Them. Done and done. They're all really lovely - go buy the whole lot!